Scouting is youth ministry! The Office of Youth, Young Adult & Campus Ministries is happy to support and work with the Diocesan Catholic Committee on Scouting to encourage and foster Catholic scouting in South Jersey. Scouts who work on religious emblem programs learn more about themselves, our church and their faith. They explore themes such as the sacraments, Mary as a model of discipleship, the Holy Spirit’s role in their lives and their vocation as disciples who give witness to their faith. These programs are great examples of comprehensive youth ministry. The programs are catechetical in nature; they help youth know and live their faith. Religious emblem programs encourage youth to develop a life in which prayer and worship are core elements. Catholic scouts who work on these emblem programs have an opportunity to evangelize others- their peers, and even their families. Scouts who engage in additional work for these emblems show themselves to be leaders, and the emblem programs help them to develop their leadership skills. In their scout troops and especially while working toward religious emblems, scouts experience positive community life among their peers and with adult mentors. The religious emblem programs bring young people into relationship with caring, responsive adults who provide pastoral care, helping young people develop positive assests and avoid at-risk behaviors. Presenting religious emblems at a wonderful annual ceremony is one way that we advocate for youth, showcasing their gifts, hard work and leadership abilities for our church and community. 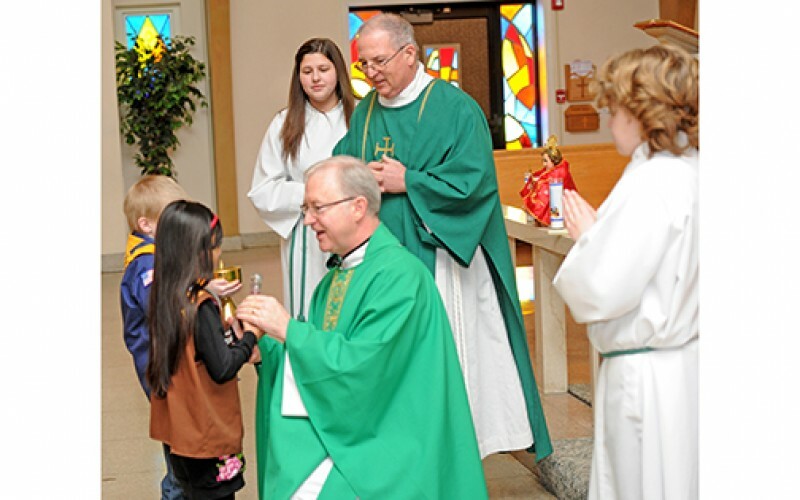 No doubt, Scouting – especially through the religious emblems programs – is youth ministry! We celebrate and give thanks for all that Catholic Scouting brings to our diocese and for all the young lives touched by scouting. All church leaders – especially youth ministry leaders- are strongly encouraged to become familiar with and support the Scouting religious emblems programs. Pastors have an excellent opportunity to encourage young parishioners involved with scouting to pursue the religious emblems. Youth ministers can strengthen the comprehensive ministry they coordinate in their parish by connecting with scout troops and leaders. If the scouting troops at your parish don’t currently engage in the religious emblem programs, youth ministers can become religious emblem counselors and work with the scouts on these programs. If your parish does not sponsor scout troops, a parish youth ministrer (or other adult volunteer) can still reach out to area troops to offer the opportunityfor the Catholic scouts in those troops (your parishioners!) to work on the religious emblems for their faith tradition. At the very least, youth ministry leaders and catechetical leaders should avail themselves of the resources and activity ideas in the religous emblem program leaders’ guide. These are inexpensive resources that contain great, practical ideas that can be incorporated into parish faith formation opportunities including; youth nights or retreats.